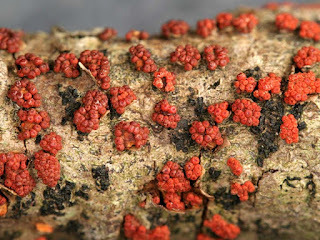 Coral spot fungus Nectria cinnabarina, photographed by Michael Wood. 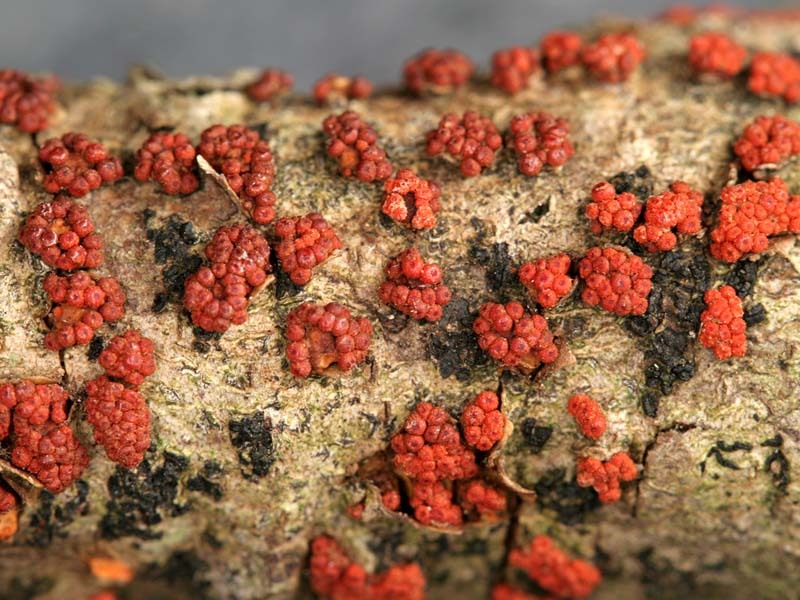 Nectria is a diverse genus of fungi producing uniloculate ascomata not immersed in stroma or substratum, found on decaying wood or leaves (Rossman et al. 1999). Characters (from Rossman et al. 1999): Stroma well-developed, pseudoparenchymatous. Ascomata superficial, generally aggregated on a stroma. Ascomata subglobose, globose to ellipsoid, collapsing cupulate, red to dark red, KOH+ purple, ostiolate, with relatively thick walls, more than 25 µm, often with warted outer region of thick-walled cells. Asci 8-spored. Ascospores broadly ellipsoid to long-fusiform, non-, 1- to multiseptate or muriform, hyaline to yellow-brown, smooth to striate. Anamorph Tubercularia and related pycnidial and synnematal species. [AO03] Aoki, T., K. O’Donnell, Y. Homma & A. R. Lattanzi. 2003. Sudden-death syndrome of soybean is caused by two morphologically and phylogenetically distinct species within the Fusarium solani species complex—F. virguliforme in North America and F. tucumaniae in South America. Mycologia 95 (4): 660-684.